Sir Christopher Gent was the main driving force behind Vodafone becoming, for several years, the largest company in Britain. He has now controversially severed all links with the firm which he became synonymous with over nearly 20 years. Even though he has not been involved in the day-to-day running of Vodafone for almost three years, the influence of the sports-loving, Conservative supporter continued to be felt. That came as no surprise given that under his leadership he transformed Vodafone from a UK-focused business with about 4 million customers to a global player with interests in more than 20 countries. Grammar school educated, Sir Christopher started his career with National Westminster Bank in 1967 before going on to work at Schroder Computer Services and ICL. 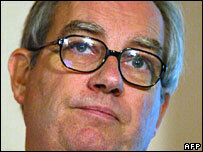 He was appointed managing director of Vodafone's UK operation at the time of the firm's launch in 1985. Over the next 10 years, he was a key player in the firm's rapid growth and a popular figure in the City, where his direct but engaging style was widely approved of. He became chief executive of Vodafone in 1997 and quickly oversaw a massive overseas expansion drive. Vodafone bought AirTouch in 1999, establishing itself in the US, and then launched a hostile takeover bid for German firm Mannesmann. The audacious £101bn bid was fiercely resisted in Germany but, under Gent's leadership, Vodafone prevailed. However, he was fiercely criticised for accepting a £10m bonus in the aftermath of the deal. Outside of business, Sir Christopher is best known for his love of cricket and his equal zeal for the Conservative Party. He remains one of the Tory Party's most prominent supporters - but as a leading Europhile he has not always been popular with all sections of the party. He supported Ken Clarke in his failed leadership bid last year, however he has now agreed to work with David Cameron by sitting on a commission looking at options for future tax reform. After stepping down as Vodafone chief executive in 2003. Sir Christopher became chairman of pharmaceutical giant GlaxoSmithKline and remains a director of a number of other leading firms. Besides family and politics, Sir Christopher also lists golf and horseracing as among his other interests. He is a member of the Royal Ascot Racing Club, an exclusive horseracing syndicate which owned Motivator, the winner of the 2005 Epsom Derby. The race, ironically, was sponsored by Vodafone.